BATON ROUGE – Due to the dangerous heat levels in the state, a heat advisory has been issued for the Baton Rouge area until Friday at 7 p.m. 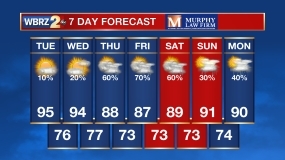 According to WBRZ Meteorologist Josh Eachus, Thursday and Friday will have afternoon heat values from 105 to 110. The National Weather Service has also indicated that forecasts for the state are in the mid-90's to upper-90's. The temperature along with the dew points causes the heat index to exceed 100 degrees Farenheit. - Wear lightweight, loose fitting clothing and a hat. - Drink water, even when not thirsty. - Take frequent breaks when working outdoors. - Save strenuous exercise for the early morning. - Check on loved ones and neighbors who may need assistance dealing with the heat. - Wear sunscreen and don't stay in the sun too long. - Know the signs and symptoms of heat exhaustion and heat stroke. - Take breaks in shaded or air-conditioned areas.